Ca2+-activated NADPH oxidase in testis, spleen, and lymph nodes. J. Biol. Chem. 276: 37594-37601, 2001. 2. Kamiguti, A. S., Serrander, L., Lin, K., Harris, R. J., Cawley, J. C., Allsup, D. J., Slupsky, J. R., Krause, K.-H., Zuzel, M. Expression and activity of NOX5 in the circulating malignant B cells of hairy cell leukemia. J. Immun. 175: 8424-8430, 2005. 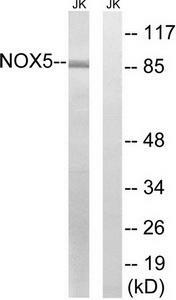 Western blot analysis of extracts from Jurkat cells, using NOX5 Antibody. The lane on the right is treated with the synthesized peptide. (0.5ug/ml) staining of Human Testis lysate (35ug protein in RIPA buffer). Primary incubation was 1 hour. Detected by chemiluminescence. Western blot analysis of extracts from Jurkat cells, using NOX5 antibody.The lane on the right is treated with the synthesized peptide.